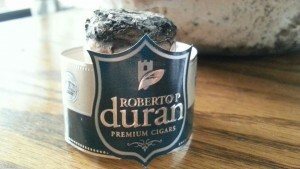 I recently received a few samples of the new eponymous Roberto P. Duran line announced earlier this year. The line was presented as a progressively medium to strong cigar, estimated to be 20% stronger than the company’s earlier Azan brand. The binder and filler are predominantly Nicaraguan, with an added leaf of Latin American filler (no country specified). 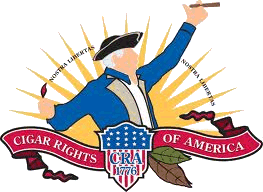 The wrapper is an Ecuadoran Habana Criollo, grown on Duran’s plantation and described as “very silky with a light brown Colorado color.” The samples I received were the 6” x 60 “Cacique Guama” vitola. Two have been smoked for today’s review. 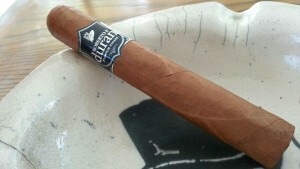 At retail, this vitola will be priced around $16. Continuing with the customary pre-light examination, I have found the prelight draw to be quite sweet, with some oat or grain flavors and a slight tingle on the lips. The aroma is a much deeper sweetness, almost plumlike in character. At first light the RPDCG provided a flood of smoke, with moderate spice and flavors of red pepper accompanied by other, lighter spice. I must say, this has bene the most surprising aspect of this cigar. The deep, sweet aroma and cold flavor led me to believe the spice would be in the background. During the first five minutes, the pepper flavor is unmistakable….not in degree, but in quality. To fully experience what I speak of, get a full retrohale and release the smoke as slowly as possible. The predominant flavor in these early moments has the *quality* of a fresh, just-barely-ripe jalapeno without quite as much bite. It settles quite a bit by the one-inch point, and the spice and pepper fall to the wayside and a very slightly sweet, leathery profile comes front and center. By midway, most of the spice has dissipated entirely. The sweetness has intensified and at times is even berry-like. That was an unexpected surprise, but presented in both examples smoked for this review. Each of the cigars suffered minor burn issues, in that they tended to go out if left unattended very long. Certainly not enough to ruin the experience, but worth noting for those who obsess over burn lines. The predominant flavors passing the midpoint are woodsy in nature, with a backdrop of the earlier sweetness. The final portion of each cigar showed very consistent development of the woodsy core, coupled with a bright nuttiness and waning sweetness. The strength begins to pick up here as well, and will continue to build for the remainder of the smoke. For a cigar with which I was entirely unfamiliar previously, the RPDCG has performed quite well. Construction is generally very good, appearance attractive, and the flavors pleasant – especially for those who enjoy a woodsy core with intermixed with sweetness to keep you guessing throughout. While these examples were not within my normal preferred vitola, I found it entirely entertaining. This is a solid smoke. This price may be an issue for someone unfamiliar with the line, I believe it’s definitely worth checking out.